Maybe it will be a moot point. 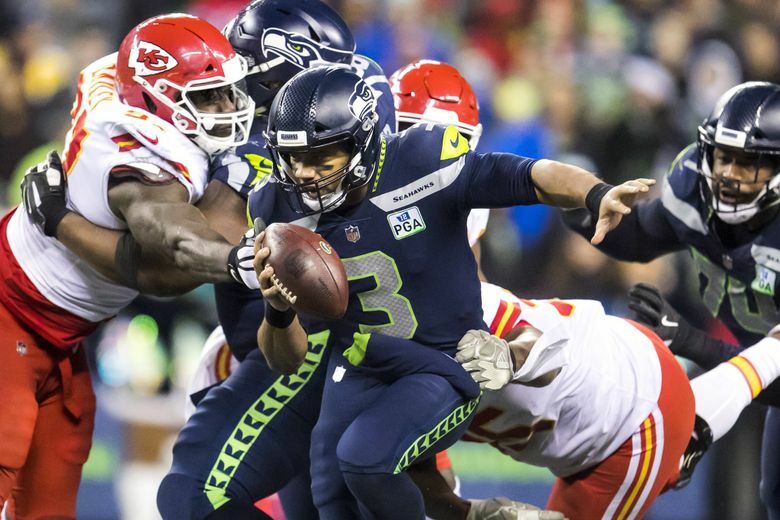 Maybe Russell Wilson and the Seahawks will use Monday’s contract deadline, set by him, as the impetus to hammer out an 11th-hour deal that would end, once and for all, the wild speculation about the quarterback’s future. But maybe that deadline will pass, with Wilson still in the same place: Approaching the final year of his contract without an extension in hand. And then, it would be open season on rumors, innuendo and predictions regarding how this impasse would play out. The scenario that seems to be gaining the most buzz is that the Seahawks should, or could, or will, trade the most successful quarterback in franchise history. Which I happen to believe would be a massive, instantly regrettable mistake. Oh, I certainly understand the arguments, which mostly revolve around a Catch-22, of sorts: You can’t win in the NFL without a franchise quarterback, but once you have to pay a franchise quarterback, you can’t afford to build a winning team around him. There is some merit to that argument, especially as quarterback salaries continue to skyrocket. And those who espouse this theory usually find a way to convince themselves of Wilson’s litany of alleged deficiencies and make a case for his pending downfall — all visual and statistical evidence to the contrary. There eventually will be a team that goes this route, though clubs historically have clung at all costs to their elite quarterbacks, once they’re lucky enough to stumble onto one of that coveted, elusive breed. There will be a time when it will be deemed that the quarterback’s price tag is indeed prohibitive, and that the smarter play is to diversify. This is not that time, though the Seahawks obviously have contemplated all this. If any team likes to be bold and put itself on the cutting edge of strategy, it is them. They would rather set trends than follow them — and coach Pete Carroll and general manager John Schneider have well-earned confidence in their ability to identify and cultivate talent — such as the next Russell Wilson. That decision has been richly rewarded many times over — to such an extent that it would be foolhardy to part ways with Wilson. It shouldn’t be necessary at this juncture to list his credentials, up to and including a 2018 season in which he set career highs with 35 touchdown passes and a 110.9 passer rating, both of which rated third in the NFL — all this in a run-oriented offense. You simply can’t give up on a quarterback who has won more games in his first seven years than any at that position in NFL history (plus two NFC titles and a Super Bowl), and who is the central piece of a team with ongoing championship aspirations, on the hope that you can eventually unearth a suitable replacement. Oh, it’s going to be complicated getting a deal done. No sugarcoating that. There are salary-cap issues, contract-guarantee issues, franchise-tag issues, ego issues and now deadline issues. And the massive salary will indeed hamstring the Seahawks’ efforts to fortify the roster, and may well cost them a key player such as defensive end Frank Clark. But the motivation for the Seahawks to figure this out, and get a new long-term deal for Wilson, still far exceeds the potential ramifications if they don’t. Or, failing that, it still would be preferable to retain Wilson for 2020 and ’21 via the franchise tag, and get three more cracks at a title, than to send him away and cross your fingers on a replacement. That spawned a whole week of possible trade scenarios, and that pastime would only accelerate if the Monday deadline passes without a new deal. But the Seahawks should think long and hard about the Browns, Jets, Broncos, Dolphins, Bills — any number of teams that have flailed about for years, trying and failing to land the quarterback to lead them out of the wilderness.